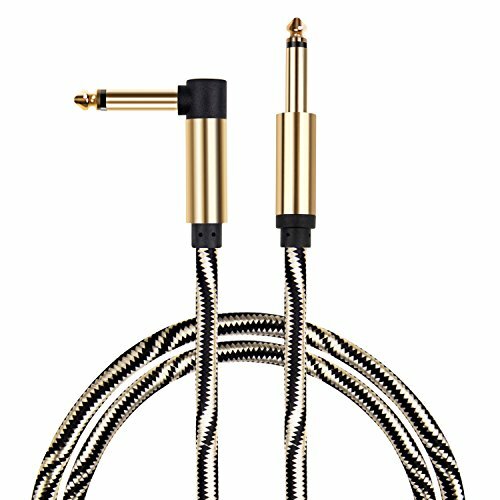 Improved professional instrument cable for musical instruments such as guitars, bass, electric organ, drum kits, electronic saxophone etc. Noiseless, high fidelity, strong anti-interference ability and perfect connection. Tensile nylon braid net cover, PVC insulation cover with high stretchability, fine copper shielding line, anti-interference PE insulation layer, oxygen-free copper conductive core, zinc alloy nickel planting jack. 40/0.1*1C high purity oxygen-free copper signal cable + 86/0.10 braid net. Higher signal fidelity, faster transmission speed and less signal loss. PVC and PE covers provide a high abrasion resistance and effectively protect cables from acid or oil which greatly increase product life. Golden&black nylon braid jacket, elegant fashionable with durability. Cable core improved from 7/0.16 to 40/0.10, conductive copper braid net improved from 80/0.1 to 86/0.1, PVC protecting cover improved from 65p to 85p, covering jacket improved from cotton to carbon fibre. Super Qualität, Top Preis !